Viewing articles 41 to 78 of 78 total. While we are looking for a new Dog Control Officer, please cal 716-692-4111 for any issues regarding dogs. If it is an emergency please contact 911. North Tonawanda's Mayor Arthur G. Pappas has announced the City of North Tonawanda will once again be participating in the annual Canal Clean Sweep, going into a 13th year, on Saturday, April 21st. City of North Tonawanda Mayor Arthur G. Pappas & wife Linda announces the upcoming 8th Annual Mayor's Charity Snowflake Ball to be held on Saturday, February 17th at the NEW LOCATION, Gratwick Banquet Hall. City of North Tonawanda Mayor Arthur G. Pappas has announced the next round of Hometown Heroes' Banners. The program is now open to any Veteran and not just active duty members. The initial recognition of local hometown heroes was by Sally Urban, mother of LCPL Timothy G. Serwinowski who was killed in action in support of Operation Enduring Freedom. The North Tonawanda High School and Unyts are promoting a North Tonawanda "Roll Up Your Sleeves" Challenge to all the residents of North Tonawanda to accomplish two things: - Blood Donations & Member Donor Registry. Mayor Arthur G. Pappas was present for a ground breaking ceremony in dedication of a new open air band shell in Raymond Klimek Veterans Park, which will replace the aging event stage purchased in 2003. Mayor Arthur G. Pappas will join Niagara County Legislator Rich Andres, North Tonawanda Director of Parks and Recreation Patty Brosius, as well as additional City and County Officials, for a ground breaking ceremony in dedication of a new open air band shell in Raymond Klimek Veterans Park. Live Hose Volunteer Fire Company is the recipient of the 7th Annual Project H.O.P.E Award. Project H.O.P.E., which stands for "Helping Others Paint Exteriors," was initiated by Mr. Gooch in 2011. Pulp 716 Coffee and Comics, is the newest business to open its doors on Webster Street in Downtown North Tonawanda. Located at 31 Webster Street. City of North Tonawanda Mayor Arthur G. Pappas is announcing Police Chief William R. Hall is officially retired from service with the City. The Canal Fest Tug of War between Tonawanda and North Tonawanda has been a Canal Fest tradition going back to the beginning of the festival. 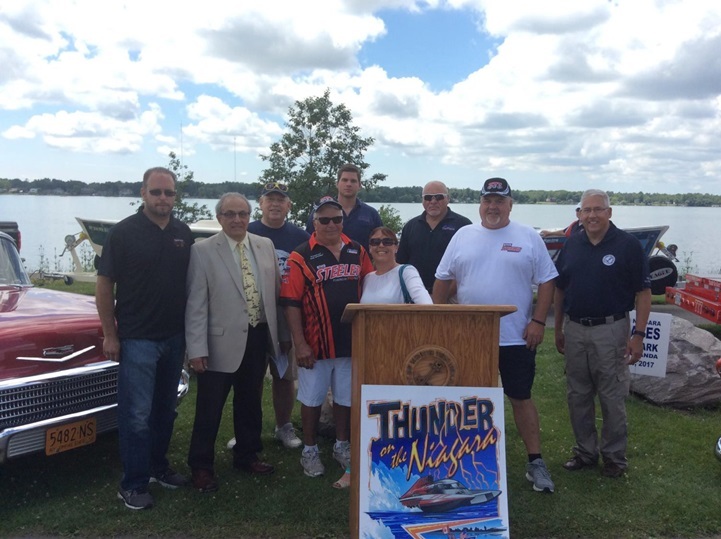 Snyder Industries will present the Thunder on the Niagara boat racing event as it celebrates its 1th year at Gratwick Riverside Park. Snyder Industries will be the key sponsor for this year's event. The 2017 Thunder on the Niagara boat racing event will take place at Gratwick Riverside Park. Mayor Arthur G. Pappas announced the inaugural, Thursday's on the Water concert event. Mayor Arthur G. Pappas will be announcing the new Thursday's on the Water events that will take place at Gratwick Riverside Park during a Thursday afternoon press conference. CSX Transportation will be performing maintenance on various railroad track lines and crossings throughout the City during this summer construction season. North Tonawanda Mayor Arthur G. Pappas participated with the volunteers of Twin Cities Meals on Wheels last Friday. Mayor Arthur G. Pappas along with members of the United Veterans' Council of the Tonawandas, wish to invite the public in an annual Memorial Day of events. Mayor Pappas Announces "Tree City USA"
The Arbor Day Foundation has once again named the City of North Tonawanda "2017 Tree City USA" in honor of its commitment to effective urban forest management. Mayor Arthur G. Pappas will join City Officials and Senior Forrester Patrick Marren of the New York State Department of Environmental Conservation for the dedication of a tree in Heritage Park. The City of North Tonawanda will once again be participating in the annual Canal Clean Sweep, going into a 12th year, on Saturday, April 22nd - Earth Day. City of North Tonawanda Mayor Arthur G. Pappas and his wife Linda hosted the Mayor's Annual Charity Snowflake Ball on February 18th which was again very successful. City of North Tonawanda Mayor Arthur G. Pappas & wife Linda will host the 8th Annual Mayor's Charity Snowflake Ball which follows in the tradition that former Mayor Ortt and wife Meghan started in 2010.